Steve Mauzy: Debt is a four-letter word – literally and figuratively. 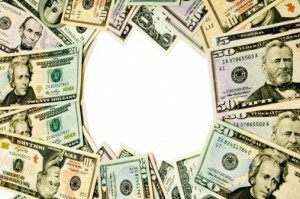 Attempting to amplify your initial capital investment with borrowed money is known as buying on margin. The debt assumed is called margin debt. Of course, you’d like to use leverage in the first scenario. Most investors, though, use leverage in the second scenario. What’s more, the second scenario occurs after a strong bull-market run, not unlike the run over the past six years. Not surprisingly, investors have loaded up on margin debt. NYSE margin debt exceeds $500 billion. If we go back to March 2009 – the depths of the stock market correction and the beginning of the current bull market – margin debt was below $200 billion. Stock prices obviously play a role. The higher the price, the more you can leverage. With the major market indexes triple their 2009 levels, it’s understandable that we see more margin debt used. Advisor Perspectives offers additional insight on margin debt, though, and additional reason to tread carefully. In bear markets, investors are credit-balance positive. They eschew debt and largely sit on cash. In 2009, cash balances on the NYSE exceeded $150 billion. In bull markets, investors appear willing to roll the dice until the bubble bursts. 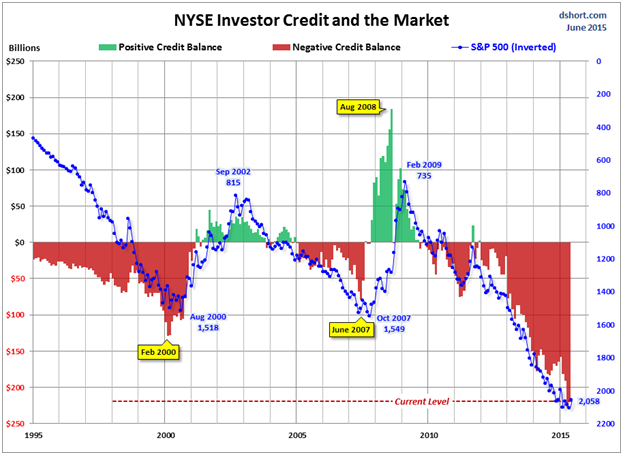 In early 2000, right before the Internet bubble burst, NYSE stocks had a negative credit balance of $125 billion. Today, the negative balance exceeds $200 billion. In short, high positive credit (cash positive) balances signal buying opportunities. High negative credit (margin debt) balances signal market tops. I don’t know if the market is set to roll over, but I would think long and hard about buying stocks with borrowed money today. Margin debt isn’t the only leveraged strategy investors used to get themselves in trouble. Leveraged investments tend to proliferate when stocks are on a roll and risk aversion is low. Leveraged ETFs are a prime example. Over the past three years, sector-specific directional leveraged ETFs have flooded the market. You’ll recognize them by the inclusion of “2X” or “3X” in the name. They handle the leveraging for you, and then allow you to bet on the direction of the market. For example, the Direxion Daily Natural Gas Related Bull 3X Shares ETF (NYSEARCA:GASL) lets you invest in rising natural gas prices. If you believe that natural gas prices will rise, then buy the GASL, because GASL shares leverage the increase three times that amount. As you’d expect, these leveraged ETFs are frequently floated near the apex of a market. This makes them useful contrarian indicators. As for the Direxion Daily Natural Gas Related Bull 3X Shares ETF, it’s down 97% over past 12 months. Of the 10 worst-performing ETFs compiled by ETFChannel.com, eight are leveraged sector ETFs (with the GASL taking the brass ring for worst performer). So much for betting on conviction. If you want to stay in the game and build wealth over time, take the unleveraged route by investing only money you have on hand (preferably in safe, income-generating assets). You’ll not only save yourself many sleepless nights, you’ll make more rational investment choices while awake. Investors under the duress of debt make the least rational choices, thus guaranteeing to elevate a bad situation into a terrible one. Staying solvent is about the best advice anyone can heed. You stay solvent by avoiding debt. This article is brought to you courtesy of Steve Mauzy From Wyatt Investment Research.